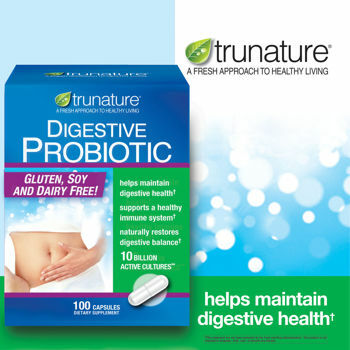 Trunature® Digestive Probiotic - 100 Capsules SALE! Other Ingredients: Cellulose, Silicon Dioxide, Magnesium Stearate (Vegetable Source), Titanium Dioxide. Warning: Consult your physician if you have a medical condition, are on medication, pregnant or nursing. Keep out of the reach of children. Store at room temperature. Refrigeration is not required but recommended for maximum potency and shelf life. For best results, we recommend you keep this product in its original blister card package. Do not transfer to a pill container. Do not use if capsule blister is punctured or torn.